Summary: For Cassandra Leung, bossing around sea monsters is just the family business. She’s been a Reckoner trainer-in-training ever since she could walk, raising the genetically-engineered beasts to defend ships as they cross the pirate-infested NeoPacific. But when the pirate queen Santa Elena swoops in on Cas’s first solo mission and snatches her from the bloodstained decks, Cas’s dream of being a full-time trainer seems dead in the water. Review: I will admit I had a few false starts with The Abyss Surrounds Us. It’s definitely not the kind of book you can pick up and read casually like you’re eating chips — one chomp, and you’re done. When I finally sat down to read it for real, though, I went through the book in one sitting. The Abyss Surrounds Us is sci-fi, set in a future world where the countries we know have been rearranged to be something else, and ships on the open sea are defended by Reckoners, giant sea creatures that fight off anything that threatens its ship. Usually, that means Reckoners take down pirate ships. When Cassandra Leung’s first stint as a Reckoner’s sole trainer goes horribly wrong, she ends up on a pirate ship, where she has to figure out a way to survive. Meanwhile, her captors are determined to change the power balance in the seas. It’s the power balance between Cas and Swift, the pirate put in charge of her, that drove the story forward. Swift is ambitious, charismatic, and reckless — and as the novel progresses… (spoiler, kind of! skip this paragraph if you want to avoid it) there’s a spark between her and Cas. The handling of the power imbalance between them was done well. That being said, I really hope their relationship works out in the upcoming sequel. It would be extremely disappointing for this series to go for the “lesbian (or bi/pan!) love meets a tragic end” trope. I’m rooting for the sequel to NOT do that. Speaking as someone who used to dream of being a zookeeper (I was five), I really loved the loving detail spent on describing Cas’s relationship with her Reckoner — the care regimen, training methods, and personality quirks. This, more than anything else, served to flesh out the new, future world shaped by these giant creatures. 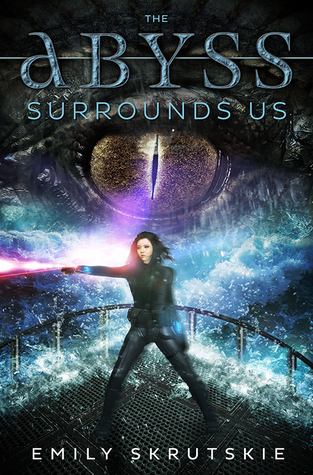 The Abyss Surrounds Us is a fast-paced, incredibly vivid sci-fi book. If you’re looking for that kind of book, or just want to read about cool pirate stuff and giant sea monsters, definitely get this book. I’m definitely looking forward to the sequel!